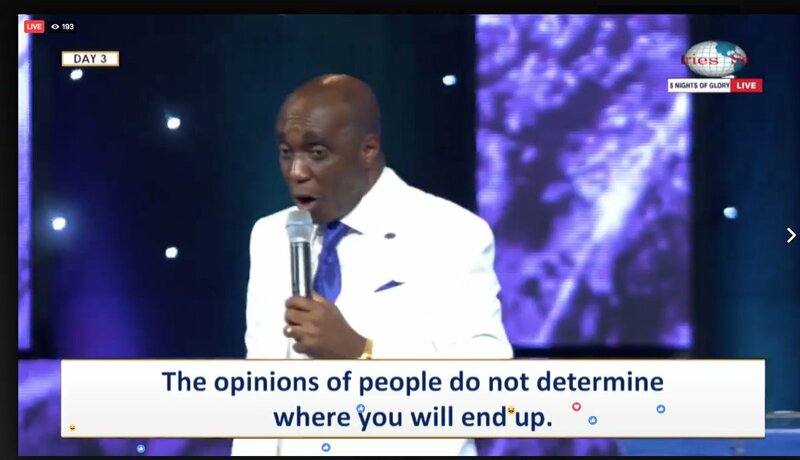 Here are some of the quotes from Pastor David Ibiyeomie, the presiding pastor and founder of Salvation Ministries on the Church 2017 edition of 5 Nights of Glory. 1. Failing does not make you a failure; it is ‘refusing to try again’ that makes you a failure. 2. A Caretaker can not dictate what a landlord has. 3. Determination opens the door for extermination of procrastination. 4. Your personal resolution to succeed is more important than anyone’s opinion. 5. The opinion of people do not determine where you will end. 6. Accept responsibility and take risks because It is risky not to take a risk. 7. The Difference between discouragement & encouragement is who you listen to. 8. The Greatest miracle is not making riches, it is not breakthrough in business. 9. There is no reason strong enough to stop you from succeeding if you desire a result. 10. Excuse is a satanic device to keep you down: beware of analysis paralysis. 11. As a child of God, you are not permitted to give up in the face of challenges. 12. Satan only brings opposition to a man that has a position. 13. Determined people do not walk by people’s opinions. 14. As a child of God, you are not permitted to give up in the face of challenges. 15. Satan does not fight a man who has nothing to offer to the World. 16. People can temporarily stop you but you are the only one that can permanently stop yourself. 17. Great people are fueled by an extraordinary determination to succeed. 18. All successful people are characterized by an indomitable determination to succeed. 19. Nobody throws stones at a tree without fruits. 20. People can temporarily stop you but you are the only one that can permanently stop yourself. 21. It takes bravery to end slavery. 22. Determined people do not walk by people’s opinions. 23. Determined people do not walk by people’s opinions.Limitation only exists in the mind of those who are not determined to succeed. 24. An idea without determination is useless. 25. In trying time, don’t quite trying. 26. Determined people turns every end to a bend. 27. Success begins with determination; only those who are aggressive in life can make progress. 28. Only the aggressive people in God’s Kingdom can be progressive. 29. Determination is generating motion from within yourself. 30. It is also the act of generating motion from within. 31. Determination is the act of making a decision or fixing or setting a purpose. 32. Your good works cannot save you only the blood of Jesus can save you. 34. If you depend on your religion to save you, you will go to hell.